This short paramotoring trip in Vizag gives you a taste of the paramotoring thrill with a 15-minute flight over the Rushikonda Beach. As you zoom across the sky, flying over the clouds at an altitude of 1,000 feet, you'll gently glide over the ocean, looking at the city on the horizon and the beautiful Bay of Bengal below you. A certified paramotoring pilot will accompany you at all times, so all you need to do is sit back, relax and enjoy! 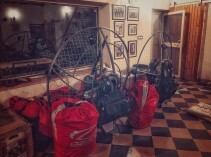 Paramotoring is a new, up and coming adventure activity that is captivating adventure seekers all across India. A little similar to paragliding, this adventure takes you zooming across the sky, except the glider is now powered with a large propeller. Paramotoring over the Rushikonda Beach gives you an exciting chance to try out a thrilling, new adventure. 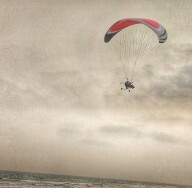 The winds sweeping the Bay of Bengal at Vizag create some of the best conditions for aero-sports like paramotoring. Flying over the sea, you can see the tidal waves crashing into the beach and a sole mountain cliff rising above ground near the shore. • Enjoy a paramotoring flight going over 1,000 feet above ground. • Glide through the sky like a bird for 14-15 mins. 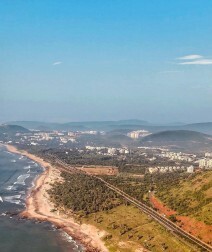 Arrive at the Rushikonda beach in Vizag about 20 minutes before your time slot. 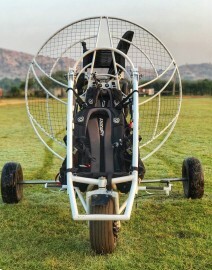 Paramotoring in Vizag takes place in two time slots: 06:00-09:30 hrs and 15:30-18:00 hrs. Once you reach, you'll fill out some paperwork, undergo a quick briefing and then head out for your tandem paragmotoring flight. For about 15 mins, you'll fly over the beach and the ocean, looking at the city on the horizon and the beautiful landscapes below you. The paramotoring pilot will safely land back at the beach. Your trip ends here.